Last night Shontelle performed at BET's "Black Girls Rock," and her performance look was eye-catching. The show will air on November 7th. 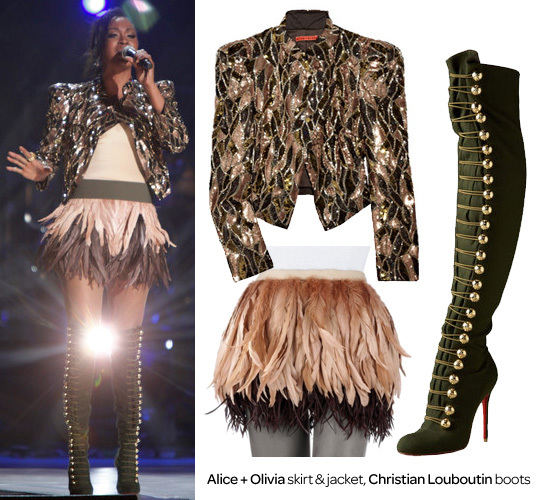 Shontelle wore a Luiza sequin-embellished jacket and Franchesca feather skirt, both by Alice + Olivia. Everyone is loving the over the knee boots right now, and Shontelle wore Christian Louboutin Flannel Over-The-Knee Boots. These military inspired boots will set you back $1,595.